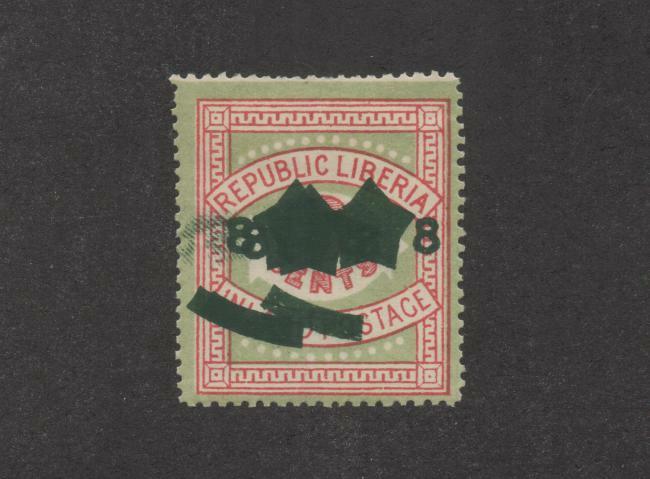 In his book A Century of Liberian Philately, Colonel Henry H. Rogers says of Liberia Scott #64, "This stamp has two forgeries, one in a light mustard green (what the heck is 'mustard green?') and the other in a mustard yellow." In giving the identifying characteristics he uses "light green" for type I and "mustard yellow" for type II, so probably the "mustard green" was a typo. 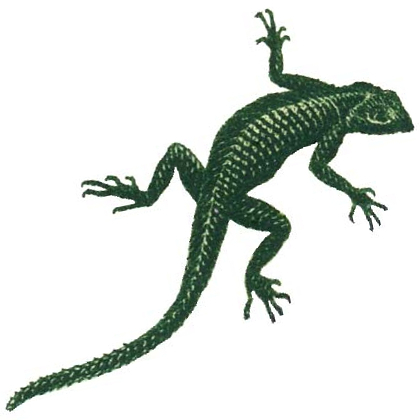 Actually there is only one type but two colors (with shades of the green). 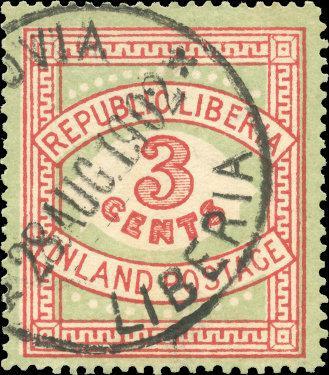 Lothar von Saleski in his book Liberia: Specialized Stamp Catalogue copies Rogers' description verbatim (one of a number of apparent plagiarisms in von Saleski's book), including that the forgeries have a (white) dot in the "E" of CENTS, a diagonal line in "S" of CENTS, and most forgeries with the fret below "R" of REPUBLIC not turning down as on the original. Also, as with the originals surcharged to 8 cents (Scott #128) von Saleski lists the forgeries revalued to 8 cents also. He also prices the revalued "mustard" regular and imperforate both unused and used. Interestingly, the illustration he gives of Scott #64 is that of the forgery. I possess three of them, ranging in background color from olive green to olive bister (Stanley Gibbons is correct to label the background of the originals as being "sage green"). Philip Cockrill, however, takes issues with them being forgeries. In his booklet The Provisional Surcharged Issues: 1892-1918 he indicates that if the forgery exists revalued 8 cents "then it cannot possibly be a forgery as recorded," although he admits that he never saw one. He also said that there was no conceivable reason why anybody should forge such unattractive stamps and get them cancelled to order, with the cancellation undoubtedly real (implying he's seen them cancelled). 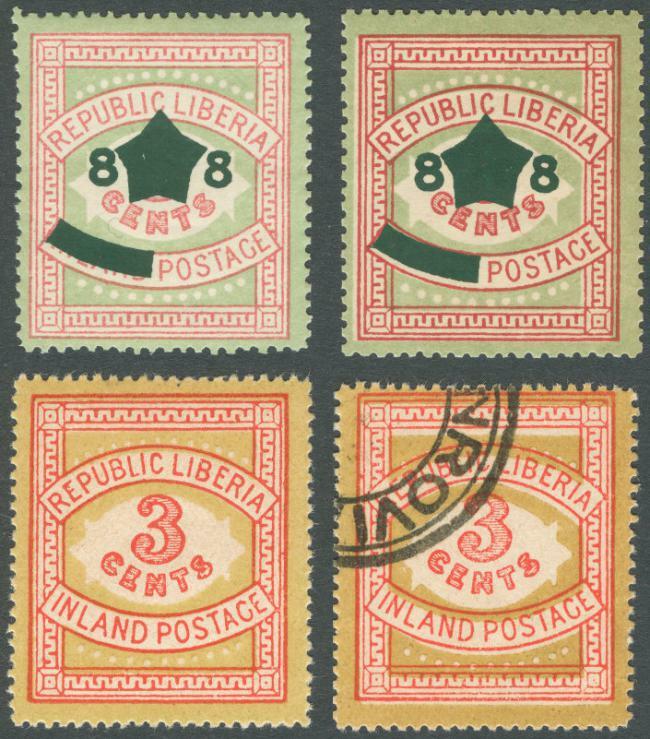 An article by Fred Farr in the July-September 1990 edition of the Liberian Philatelic Journal gives another explanation for forging them. Cockrill also indicates that he was offered many thousands of them from an elderly dealer and that they were part of the stock the controversial Hungarian-born dealer Bela Sekula (nee Szekula: see the "Paper Seal" category of this website) had purchased from the Liberian Post Office Department and that they had lain in a vault until after World War II. It wasn't until the 1950's that they appeared on the market and after that when the offer was made (Cockrill uses the term "mustard and green," but says nothing about the colors on the offered stamps). 1. Does anybody possess (or has anybody seen) any of these "forgeries" revalued to 8 cents? If so, what is the background color? 2. Does anybody possess (or has anybody seen) any of these "forgeries (with or without the revalue) cancelled? If one exists on cover, then it would be a real prize. Except for one stamp all of my mustard copies have the same shade - I call it "light mustard". The one exception is of a deeper shade, "dark mustard", and incidentally it is my only canceled stamp beside the sheet (also CTO, of course). I have never seen this variety revalued to 8 cents, though. The problem with von Saleski is that he listed a lot of material he only knew from hearsay but had never seen himself. Here's a scan of the light and dark shades of green compared with the light and dark shades of "mustard" (I think the color was supposed to look golden). In reality the differences are a bit more pronounced than the scan suggests. Looking at them now I am not sure if the shades aren't merely an effect of more or less ink; the red can be pale or rich, too. Here is a scan of #64 Type I. The red color is very light and the yellow/mustard seems to be a diff shade. The scan may not show that. Here is scan of #128 with a deep green shade. Here are 3 more scans. #128b deep green shade. 2 #128's both with triple overprints. The mustard variety also seems to be rich in freak errors. To me, it feels more like genuine printer's waste than material from a forger's lab. 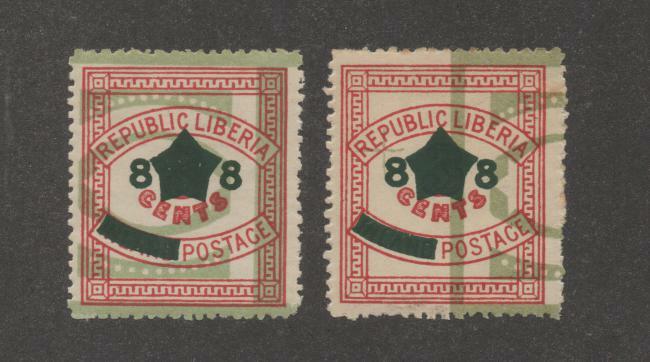 These two stamps #64 and #128 are two of my favorite stamps from Liberia. For over 45 years i have hunted for them. 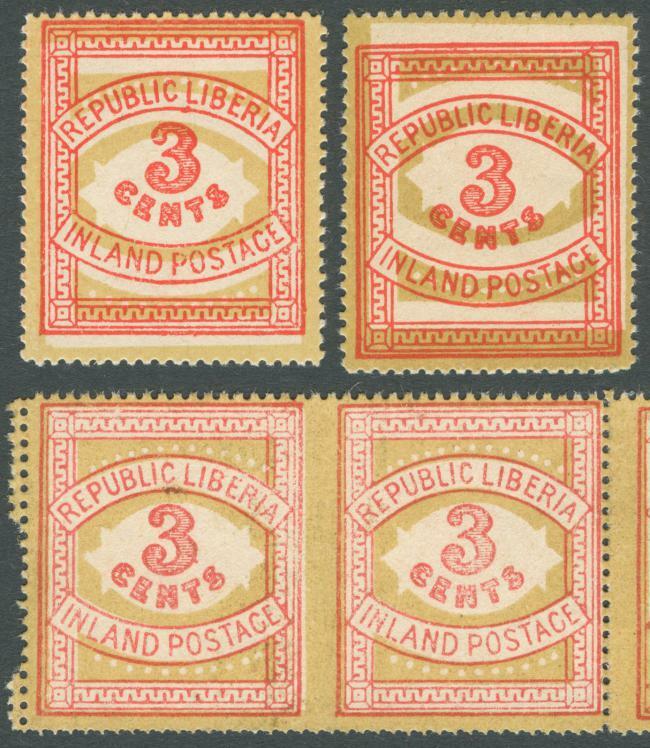 The true errors are small in numbers but like other stamps from Liberia there seems to be good amount of so called 'printers waste'. Manfred is correct why waste your time on a making a forgery. How about some more input on these stamps. Does anyone have anymore to show ? Sorry the stamp on the left is a #128a. Manfred sent me a email about that. His said most of the #128a have a light red color. Thanks Manfred. I will look at my collection of #128 and see if i have any with light red color. Great forum thread! I thought I would add a scan as well. More to show. Here is a #64 specimen. A little diif from yours. What other stamps of #64 and #128 do you have Travis ? Also do any other members of this site have anymore to show. Let's keep it going. Ok…one more time. Here are 2 diff #128's with green overprint shift. One to the left and one to the right. Also is a postally used block of #64. The date looks like Harper AU 4 69 to me. 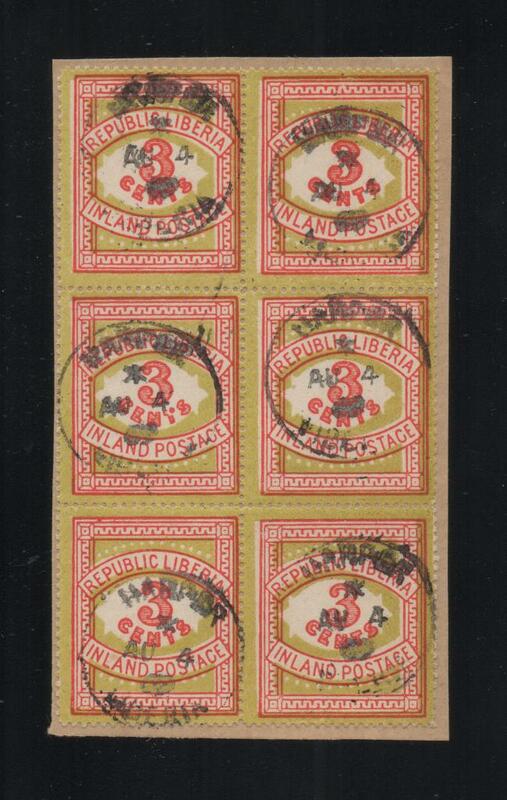 that's very interesting, a mustard block of six with CP26 Harper postmarks from 1969. 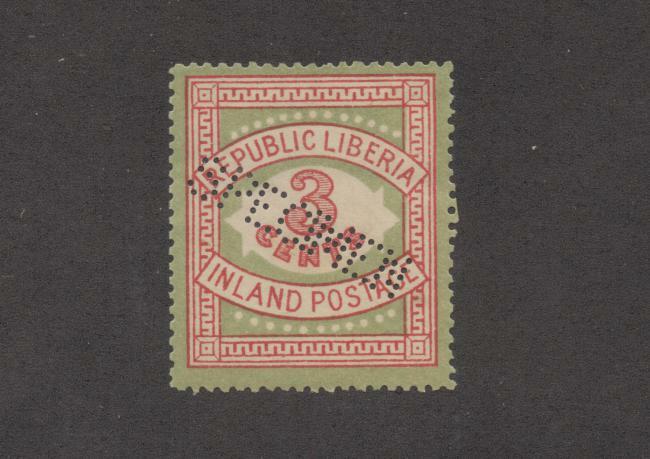 If I had to guess I would say someone took the stamps to Liberia and had them favor canceled. 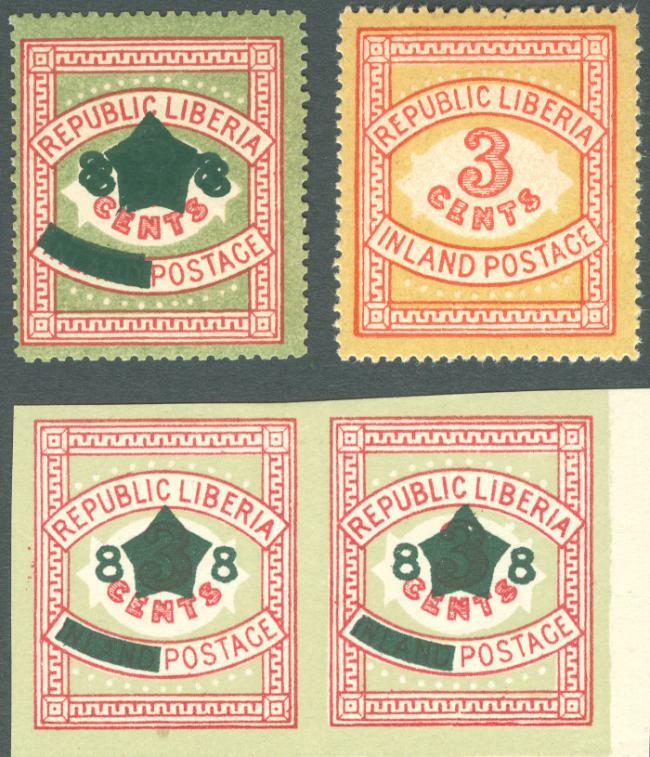 No matter what the status of the mustard shade is - rejected printing or philatelic reprint - I doubt they were ever delivered to Liberia. If the story the elderly dealer told Philip Cockrill is true Sekula must have purchased them from the printer. 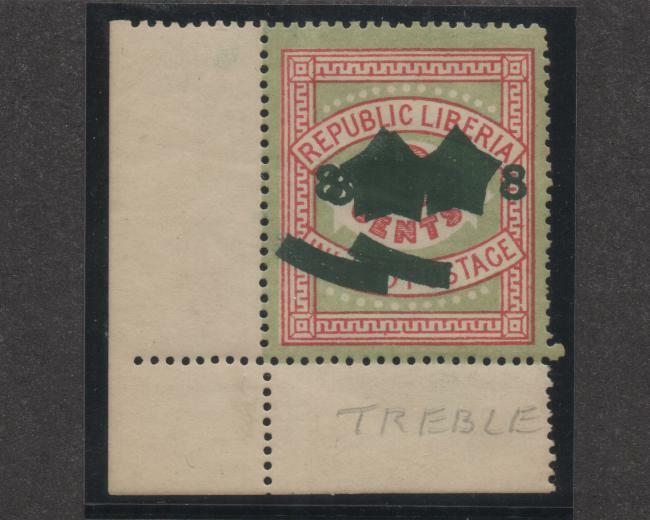 The early CTO postmarks were generally applied in England, and there was no need to send these stamps to Liberia (except for some samples, perhaps). Also, all mustard stamps I've seen so far, mint or CTO, looked too pristine to have spent any considerable time in a tropical climate. is this a British PO specimen? Cockrill said his specimen (presumably an UPU specimen) had a violet overprint. Also, the overprint on your stamp looks like the ones on the scans of the 1921 pictorials Marty sent me. I guess only Manfred, Travis, mikwizzy and myself have any info to put up on this site. Too bad. I know there has to be others who have a little more info on 64 and 128. Let's all try and take out a little time and find something on these two. I looked through my list of purchases and I couldn't find where I bought this so I may have gotten it in a larger lot. It does have a small piece of paper that has notes on it which is typical of Henry. It says "Scott 128 1913 British P.O. SPECIMEN 23x2.73mm w/o gum unique in collector's hands. See Cockrill series booklet 25, pg 50-1"
In booklet 25, Cockrill says "black or violet" and he only shows the one type of specimen overprint. His chart shows this stamp being the first to receive the B.P.O. 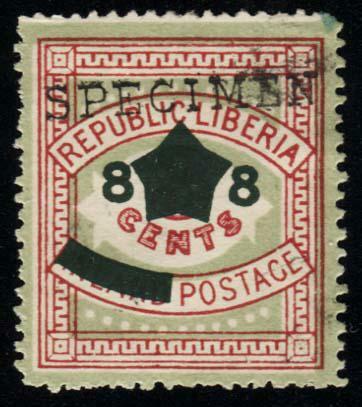 specimen overprint along with the 1921 set and others. Do you think it isn't genuine? I have no doubt that it's genuine. I just wanted to clarify that it isn't a specimen meant to be sent to the UPU (like Albert's #64 with perforated "SPECIMEN"). Although I don't have one, UPU specimens of #128 should exist in small quantities, but, like Cockrill said, your BPO specimen is pretty much unique (except perhaps for another copy in the British Postal Museum). Sorry if I was defensive. I value your opinion and you had me worried that you may be thinking it was a forgery. I will try to get some more images up later. I was really interested in all these comments, I have been fascinated by #64 and #128 ever since finding a mint pair of the "mustard" variety of 64 probably 60 years ago as a kid collector getting my first Liberias. 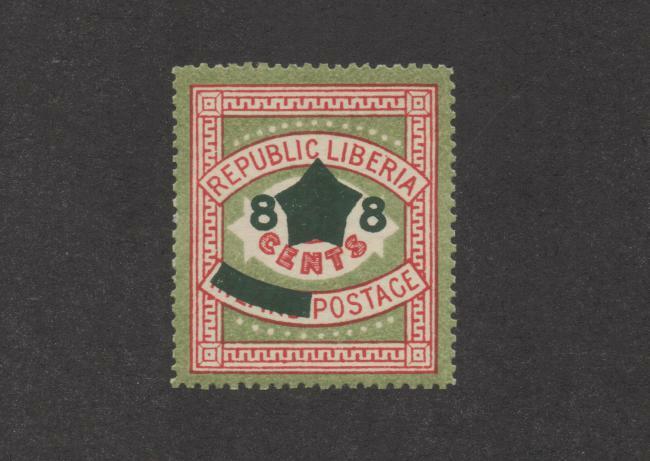 There was something about that design that hit my young eye just right, and it started a lifetime interest in Liberian philately. Have been looking for info on it ever since. Thanks to all, there's a lot here that was new to me. These and the red variety of #21 are two of my favorite stamps, each with its own little mystery. The Varaschini collection held a #128 with a violet specimen overprint (page 346). Although Varaschini's note says: quoted by Cockrill, this could refer to the perforation (12.5 X 14) and not the overprint. 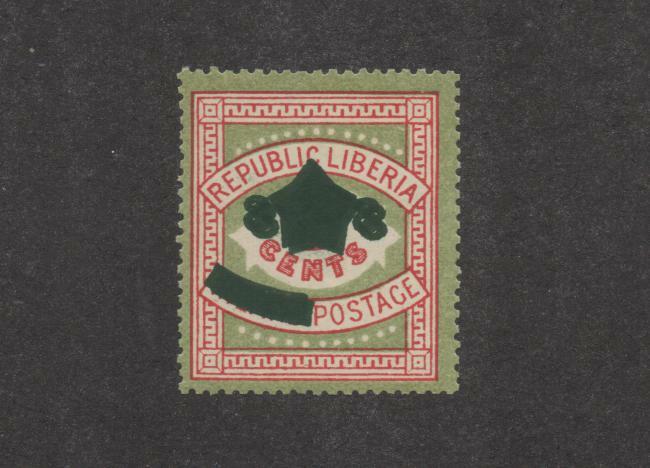 However, this specimen overprint has a sans-serif font, and according to Cockrill all Liberian stamps he ever saw bore the seriffed type. A UPU specimen? I know what you mean. The stamp is special, only that I always thought it somehow looks out of place. Or, out of time actually, at first I couldn't believe that this stamp was produced in 1897. It just doesn't fit the time period. Does anyone know a stamp with a similar design from another country? Does anyone in the group have a #64 or #128 ? "Mustard" on cover or postcard ? If so please post a photo of it. In fact if you any "Mustard" stamp that has a postmark on it please show it. If it was unissued how can it be cancelled even CTO? 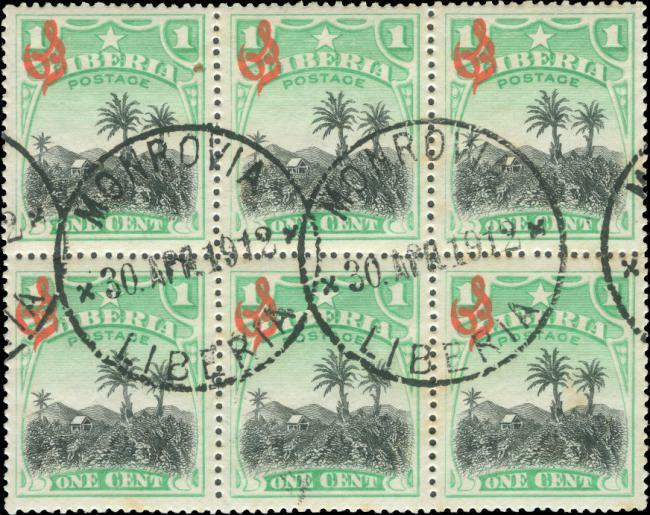 "If I had to guess I would say someone took the stamps to Liberia and had them favor canceled." It's better to read Philip Cockrill's booklet #9 pages 17-19. Scott has always been wrong on everything to do with Liberia. I have many copies of #0155 showing a postmark of 1923. Scott has the date as 1926. They have had that date for years. I think that #64a was issued but only for the sale of CTO stamps to collectors for a low price. Then later some #64a were o/p as #128a. So here you have it. 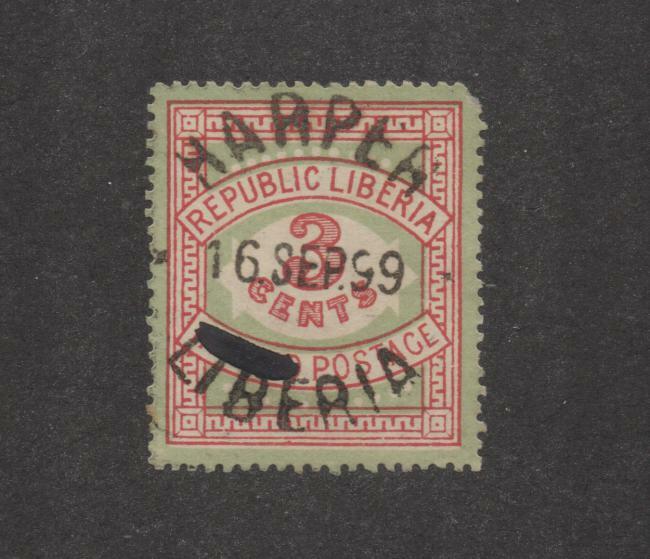 The selling of CTO of Liberia mean money for them and stamp dealers, like Bela Szekula and his brothers. Any ideas ? Here is a scan of a #128 i just got. 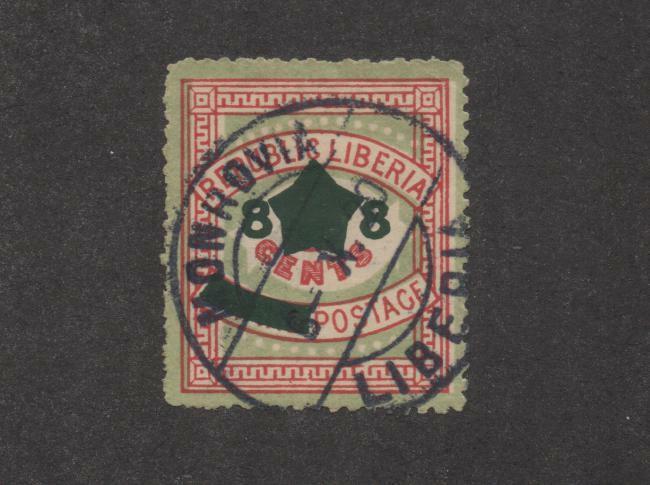 It has a cancel of '6 AUG 1914' from Monrovia. The cancel looks like the same cancel that is found on the used copies of #129-133, 072-075. So does that mean that #129-133, 072-075 cancels were done in Liberia ? Who knows ? Anyone have any ideas ? Here is a scan of #128 used with a Monrovia cancel of '6 X 20' with the 12 1/2 perf. These ones are hard to find postally used. Does anyone have one like this? Let me know. the postmark used on the provisionals of 1914 and on your #128 if quite common. I have a #64 canceled with it and several others. 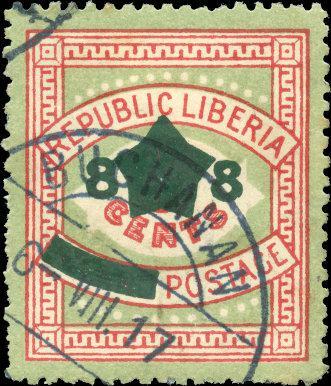 I have no doubt that all of them were done in Liberia, but the "killing" of the 1914 issue was probably a joint effort of the Monrovia post office and J.W. West. here is a used #128 perf. 12.5 from my collection, also CP21, canceled August 6, 1917. And this is the #64 with CP18 I was talking about. Finally, another example of CP18 used as a favor cancel, on a block of six of O59 (the block has full gum). Here is a 64 used with a cancel of 16 SEP 99 from Harper. The word 'Inland' has been marked with black ink of some kind. 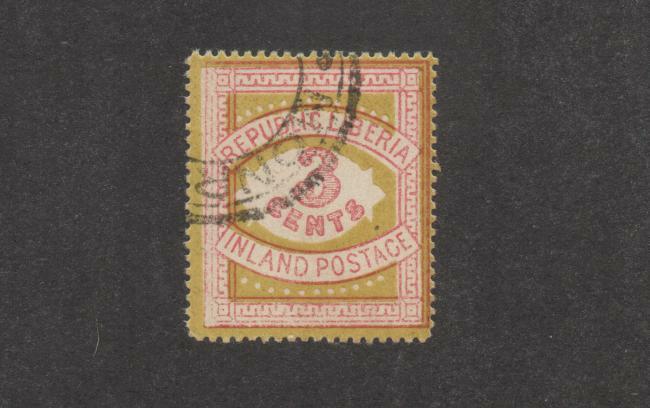 It's hard to tell if 'Inland' was marked out before the postmark or after ? Do you also have one like this ? If so please show it. The mustard shade is really much more yellow than the stamp in your scan. 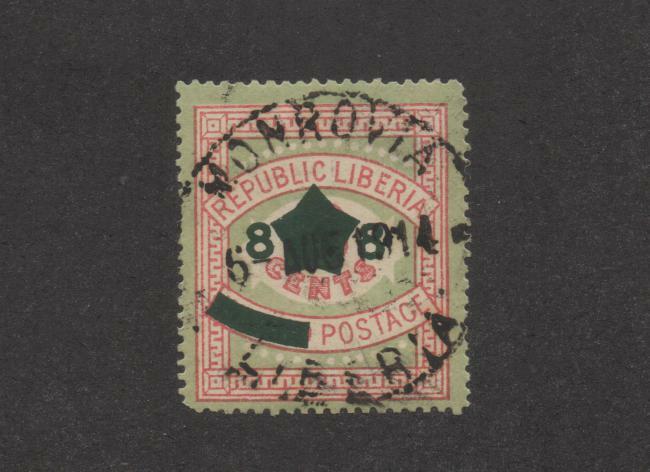 Your copy is a normal Scott #128a (there are 10 "pearls" above "REPUBLIC LIBERIA"), albeit in a very light shade of green. Please take a look at the scan below: a dark green variety with double overprint and 13 pearls (top left), a light green imperforate pair with 10 pearls, and the real mustard variety (top right). BTW, the mustard shade always has 13 pearls.